The Dutch are coming off the back of their greatest-ever group stage victory. 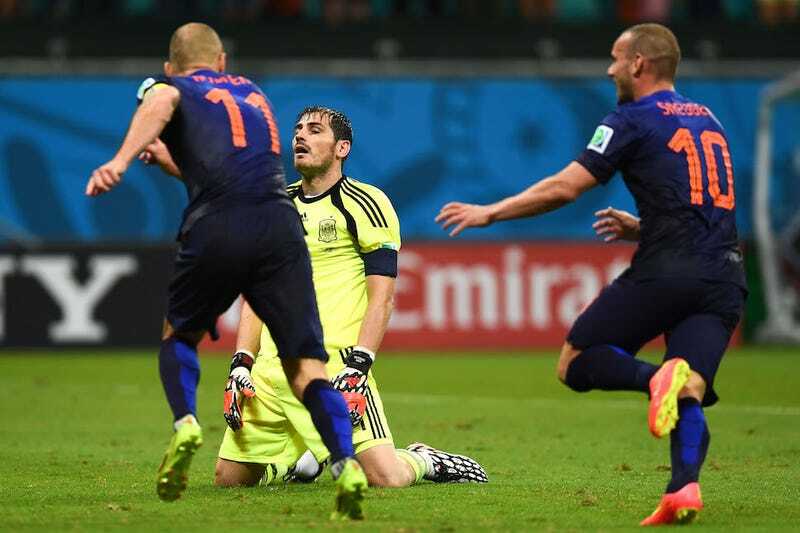 Against Spain, the Netherlands exorcised the demons of their World Cup final loss with the force and brutality of a Nigel de Jong karate kick. The long balls which led to such joy can now be eschewed in favor of a more typically Dutch style, though. They can reasonably expect a deep-lying Australian team to shell and counter, a tactical approach they are more than familiar with from lesser opponents. If the Dutch qualification record is any hint, they should be able to find a way through. Like a band of teenagers in a slasher film, Australia hung in there admirably against Chile after conceding two early goals. Had a refereeing decision or two gone their way, they might have even escaped with a point. Unfortunately for the Australians, Chile was probably the game they'd circled on their schedule to get something from. Now the task ahead is obvious—stay alive by any means necessary and make sure that fixture three has relevance. Set pieces will be massive for the Socceroos. They play the Netherlands today at noon. Wesley Sneijder, Robin van Persie, and Arjen Robben give the Dutch arguably the most dynamic a set of free kick takers in the competition. Stupid fouls near the Australian box should prove more costly this time. On the other end of the field, you have to like Tim Cahill's chance against the soft underbelly of the Dutch side. Without an established international center back to speak of, the Dutch look ripe for the taking in dead ball situations. Ron Vlaar, no stranger to an own goal, seems like the ideal candidate to target. For the Socceroos, this Dutch team is probably a better match up than Chile—no need to wake in fright. If Chile were a pragmatic side they'd look at today's 3 p.m. fixture with Spain and play for the draw. The goal difference between Chile and Spain is significant enough that a draw should pretty well cover them, regardless of what happens in fixture three against Netherlands. Chile are not a pragmatic side, as we all now know, and, like the sharks they are, will smell the blood in the water. The potential absence of Arturo Vidal could be massive but considering that Chile's version of protecting a one-goal lead was to leave two munchkins in defense and hunt a third goal, I think it's fair to say that this shouldn't change their approach much. For Spain, Chile at the Maracanã is their most important fixture in years. The collective dream of becoming the most dominant champion in the history of the sport could die with a game to spare in the group stage. If the Dutch beat Australia—as every major betting house in the world suggests—Spain are out with a loss. Win, and Spain can feel confident of advancing with only a match against Australia remaining. Vicente del Bosque has never lost consecutive games during his tenure as manager; now would not be a good time to start. Spain and Chile faced each other in a 2013 friendly in Geneva. That night, Spain needed a late Jesús Navas goal to salvage a draw. A draw won't be enough this time. Del Bosque's great advantage is knowing exactly what Chile will do. Chile aren't going to change. Will he? The tiki-taka grave dancers have never been more excited. Screamer is Deadspin's soccer site. We're @ScreamerDS on Twitter. We'll be partnering with our friends at Howler Magazinethroughout the World Cup. Follow them on Twitter, @whatahowler.